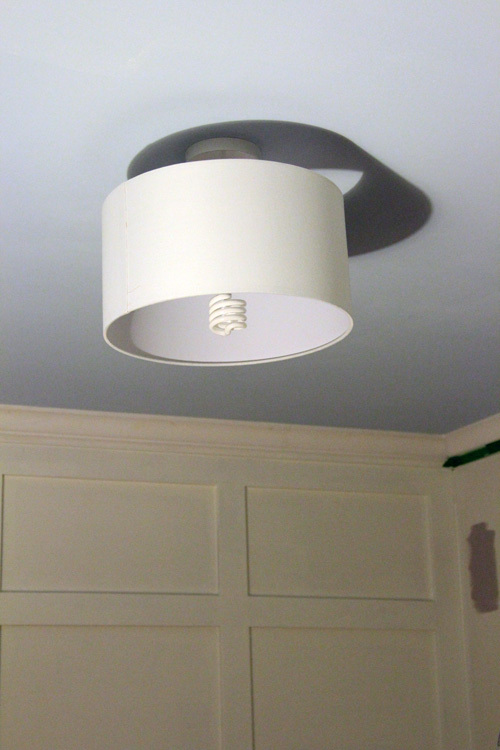 When our house was being built, we opted for just some ceiling fan pre-wires in all of the upstairs rooms. 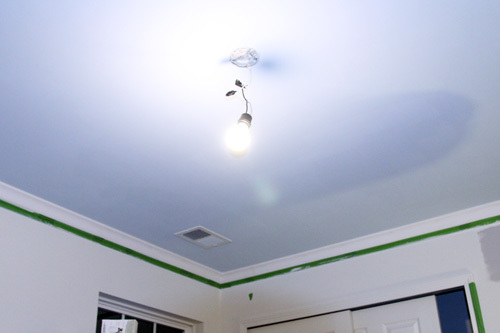 Any additional lighting was ridiculously up priced and we figured if we wanted to eventually do recessed lights upstairs, we had access to our attic. Fast forward 2 years (ah, it will be 2 years since we closed in just 2 weeks!) and we’re now ready to use a spare bedroom as a nursery. 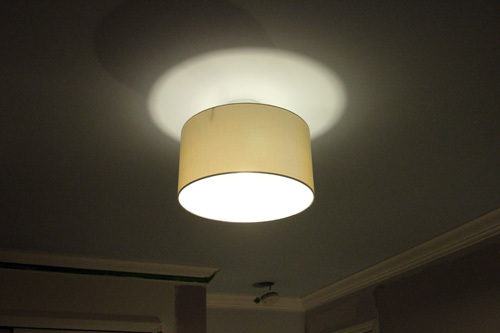 And this is our light fixture…. I wanted a clean, modern light fixture in here. 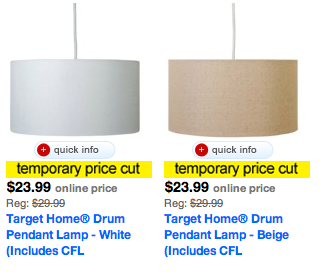 I’ve expressed my love for drum pendants before, but somehow I have not put a single one in our house yet! 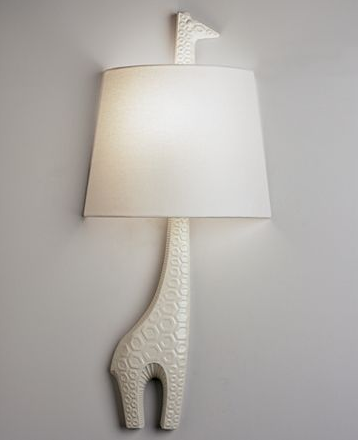 I figured I’d start with the nursery, especially since our first nursery purchase were some Jonathan Adler giraffe sconces which come with white shades. 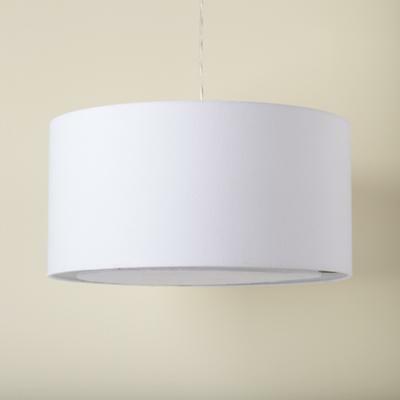 I have a gift card to the Land of Nod and I remembered that they had some affordable pendants, the Hangin’ Around Lamp. Here are some night time pictures of our new friend. It looks so nice and classy against the paneled wall. And the sky blue ceiling. One downside to the inexpensive option is that it does not come with a diffuser. 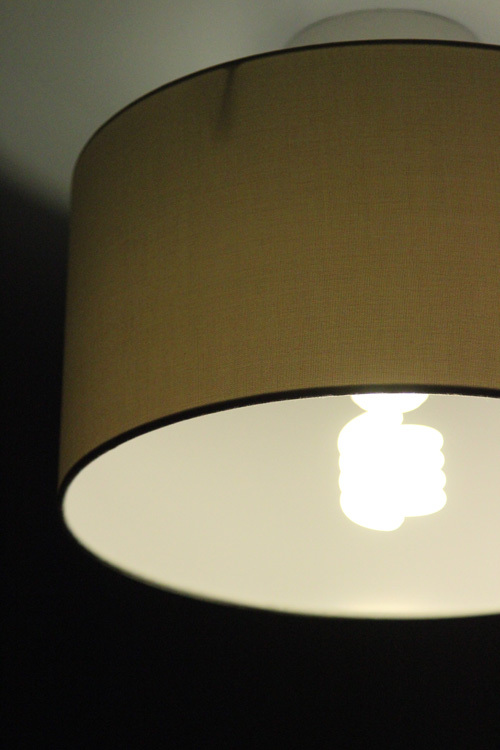 The lightbulb is extremely bright and an eyesore (in multiple ways). I started googling around for solutions and I think we’ll try a silver tipped light bulb first. The bulb hangs low and I’m a little nervous to put any sort of material on the bottom of the shade. 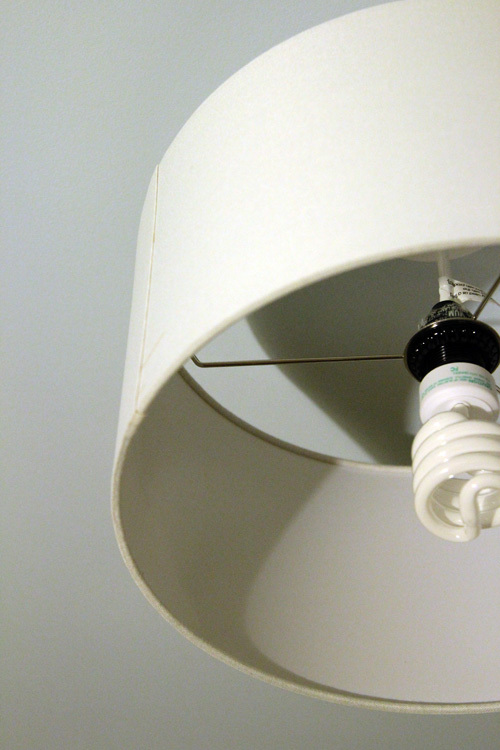 Though I found this Apartment Therapy post which says that a CFL lightbulb emits much less heat than a standard bulb, so creating a diffuser shouldn’t be a problem. We’ll probably try picking up a different bulb first. The blue ceiling is awesome! And the paneled wall is looking great. Can’t wait to see the the paint job finished, good luck! The nursery is looking great! Hope the painting goes well! I love the pendant light! It’ll go really well with those adorable giraffe lights! 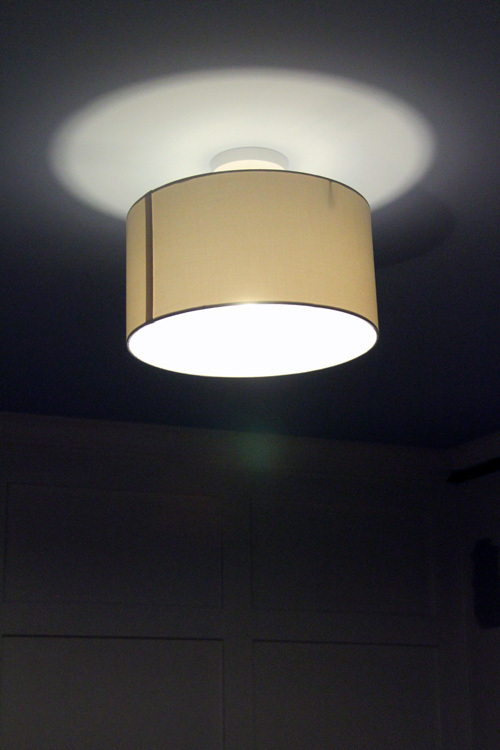 The pendant light looks great! Can’t beat what you paid for it either. I also love the cutie little giraffe lights. Can’t wait to see it all come together.